State prosecutors have accused former Defense Minister Mohamed Nazim of conspiring with opposition Jumhooree Party (JP) Leader Gasim Ibrahim’s Villa Group to harm state officials. The pen drive was confiscated along with a pistol, live bullets and an improvised explosive device during the early morning raid, police have previously said. Presiding Judge Sujau Usman denied Nazim legal representation at today’s hearing stating the Prosecutor General’s Office had not yet decided which documents from the pen drive were to be kept confidential and which were to be made public. However, Nazim’s lawyer Maumoon Hameed was allowed inside the courtroom as an observer. The former defense minister pleaded not guilty. Judge Usman gave Nazim three days to re-appoint a lawyer and answer charges. He is to be kept in police custody until the trial ends. Nazim’s trial comes amidst heightened tension in Malé. Former President Mohamed Nasheed is also in police custody pending a verdict in terrorism charges over the military detention of a Criminal Court Judge in January 2012. Nasheed’s Maldivian Democratic Party and Gasim’s JP formed an alliance shortly after the weapons find at Nazim’s house and have pledged to overthrow President Abdulla Yameen’s government. Nazim’s wife, Afaaf Abdul Majeed, was also in court today on the same charges. But Arif told the court the PG’s office was withdrawing charges, claiming the confidential documents had brought to light new information. According to Hameed, the court has not yet provided lawyers with any case documents on charges against Nazim or Afaaf. “We believe there is no basis to charges against Colonel Nazim’s wife, in the same vein, we believe there is no basis to prosecute Nazim as well,” he said. Afaaf was sent a summons to attend today’s trial on Monday, despite having received no indication she was under suspicion for possessing illegal weapons. When the trial began, she was sitting next to Nazim at the defence stand, but was later transferred to the observer stand. “My freedom alone won’t do,” Afaaf replied. Hameed said the Criminal Court in a separate remand hearing ruled Nazim posed a threat to society and must be kept in police custody until the trial ended. Hameed said he would appeal the ruling as well as a February 11 ruling in which Nazim was remanded for 15 days on additional charges of treason and terrorism. Despite the controversial weapons find on January 18, the police made no moves to arrest the former minister, and Nazim continued to fulfil his ministerial duties the next day. President’s Spokesperson Ibrahim Muaz Ali at the time told media that President Abdulla Yameen continued to have “full confidence” in Nazim. The following day (January 20) Nazim was dismissed. On February 9, police submitted files to the PG Office requesting charges be pressed against Nazim for illegal weapons possession. Within hours, at 12:30am on February 10, police arrested Nazim on new terrorism and treason charges. The former minister’s defence team said the weapons were planted at his residence, alleging police officers spent ten minutes inside Nazim’s apartment alone after they herded the retired colonel and his family into the living room. The former Police Chief Abdulla Riyaz claimed Nazim is being framed. Police have repeatedly denied framing Nazim, describing allegations as a “baseless” attempt at discrediting the force. Despite Nazim’s detention on new charges, the police have not questioned the former minister even once, Hameed claimed. State prosecutors did not offer substantive evidence to either arrest Nazim or keep him in detention, Hameed contended. 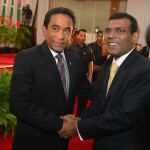 The allied opposition parties have described the state’s prosecution of Nazim and Nasheed, as well as alleged economic sanctions against Gasim as part of President Yameen’s plan to establish authoritarian control. The government, however, claims it has no influence in the charges against Nasheed and Nazim, stating the trials were initiated by an independent Prosecutor General and tried through independent courts. The government has no influence in the charges..? It has had nothing BUT influence. Who do they think they are fooling? Not many, lets hope. It's the Villa bashing season, so almost every ill that falls by the way of the regime will be blamed on Villa Group. Former president Mohamed Naseed said he resigned at gunpoint, a coup d'état Nazim and Gasim was involved, evidence of that is in public record. So I have no dought these guys have the capacity to do the same to another president, in a time Villa is facing assets taken for breaching agreement with government. No matter it's Nasheed government or another government Gasim will protest if that sitting government does not favour Gasims business interests lawfully or unlawfully it has to be Gasim should get what he wants. Nazim was blackmailed using his wife as a compromise. Just as predicted charges against his wife is dropped, if he agreed to governments bullxxxx lullaby . The most rogue corrupt government that has ever come to power in maldives. No doubt!!!! The politics of chicken…. Golabo politics…. In Golhabo politics all personal politics are played in the name of protecting government. Why a government need protection, I thought government is people, isn’t Yameen wants to cling to power and simply violating the rights of people. I want Yameen to be removed today and I am doing all what I can do to remove this guy from the seat of president. Does this means, this is a crime what f***** joke. Anni has scarified to get rid of this culture but due to some brain dead idiots again we see the repeat of Golhabo politics. The problem is these fishermen have no country; there is nothing as a country that you can expect from it so it is simply politics of bull fight. Anni has arrested one Judge and all his life is hanging with the thread of Ablho Gaazee, whenever you need to stop him from breathing just pull it. Nazim is a bite to fish out all trouble makers. No one is unaware about this monkey business, but those who hate Anni simply for one reason “laa dheenee” don’t care what Yameen and his gang are doing as long as Anni is neutralized. All the forces that can uphold democracy is against Anni , the only hope for democracy in Maldives is foreign influence , the only foreign government who has any interest in Maldives is India so let see what pressure India can put on the Golhabo regime. "Former president Mohamed Nasheed said he resigned at gunpoint, a coup d’état Nazim and Gasim was involved, evidence of that is in public record. So I have no dought these guys have the capacity to do the same to another president, in a time Villa is facing assets taken for breaching agreement with government.". Nazim and each and every one in the Villa Group could be having brains and other organs for thinking committing crime! Should they not be accused, found guilty and sentenced for every possibility crime before they are comitted? Can this not be treated justice served in advance before they are possibly committed?